Thank you Bam-Bam for actually capturing the screen shot, as I fell asleep far to early last night. For being Pot Limit, I was actually surprised that it took almost 3 hours for 21 players. Congrads to PirateLawyer for the win, and Waffles for the 2nd place finish. Almost sorry I feel asleep and missed that. Next Week for the Skillz Game: Limit H.O.S.E. Probably not much playing for me this week. We are flying off to Maine this weekend to spread my mother-in-law's ashes. Should be a lot of fun, and shorter then usual since it is pot limit. Also dont forget NY Ramblers series Main Event. See his link off to the left for more details. 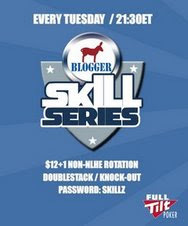 Skillz Game Results - New Money List Leader! I personally had a night of bubbles. I bubbled the Skillz Game, bubbled NY Ramblers $26 HORSE tournament, bubbled a WCOOP Step 1 in NL Hold'em (4th of 9), and semi-bubbled a WCOOP Step 1 in PL Omaha (3rd of 9) which gave me another Step 1 ticket. A lot of time being taken up lately with getting the house packed to put it on the market, but I get to play live after my Fantasy Football draft on Saturday! Any suggestions of games to add will be taken into consideration. I am back and with no poker playing at all, and I plan on getting back in the swing of things on Tuesday. Looks like we hit a mid-summer hiccup with the Skillz Game last week, as there were only 8 signed up, and that included me donating. Hopefully that numbers will get better. As long as people keep showing up (not matter how many/few) I will keep hosting it. See you all there tomorrow for some 7 Stud Hi Only Double Stack Fun. I am on vacation, but I am still registered (but likely donating my entry fee) for the rest of you to win. I will be back next week to play!! Next Week is Double Stack Limit Hold'em. I will be on vacation, so i will not be playing, although my chips and my bounty will be available for all to win!! Please check it out to the right. As I final tabled the HORSE last night and had a mixed bag of emotions of those still left when we got down to the bubble, after playing 3 hours with 22 starts and still not done. The chip stacks will stay Double Stack for the next two tournament, and then I will decide, talking into account the results of the Poll. Any comments on this are welcome also. I will updated the leaderboard tonight when I get home. Password as always is Skillz. Dont forget NYRamblers Poker Series also at 9 PM. Tonight is Limit Hold'em. Password is epicfail. 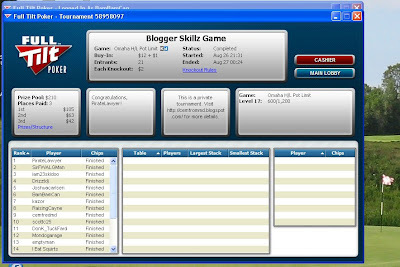 Thank you Instant Tragedy for LivePokerRadio Tournament last night. Didnt make the first break as I again overplayed AK against Queens and couldnt hit. Tuckfard Opens were a blast as always also, just missed cashing in both, and only got one knockout, but those are so much fun the cashing doesnt matter.